Having spent a decade and a half in the education sector, I couldn’t resist from taking this opportunity on Blog Action Day to highlight the issue of The Right to Education. Education is the fundamental human right and is the basis for the exercise of all other human rights. It provides freedom, independence and empowerment and helps in developmental benefits for the individual and through him to the nation and the world. Yet there are millions and millions of children who remain deprived of this basic right, mostly due to poverty. The Right to Education provides right of every person, every child to have access to quality education without any discrimination. Normative instruments of the United Nations and UNESCO lay down international legal obligations for the right to education. These instruments bear witness to the great importance that Member States and the international community attach to normative action for realizing the right to education. It is for governments to fulfill their obligations both legal and political in regard to providing education for all of good quality and to implement and monitor more effectively education strategies. UNESCO’s educational objectives are to support the achievement of Education for All (EFA); to provide global and regional leadership in education; to strengthen education systems worldwide from early childhood to the adult years; to respond to contemporary global challenges through education. As the only United Nations agency with a mandate to cover all aspects of education, UNESCO’s work encompasses educational development from pre-school through to higher education, including technical and vocational education and training, non-formal education and literacy. The Organization focuses on increasing equity and access, improving quality, and ensuring that education develops knowledge and skills in areas such as sustainable development, HIV and AIDS, human rights and gender equality. UNESCO works with governments and a wide range of partners to make education systems more effective through policy change. It coordinates the Education for All movement, tracks education trends and raises the profile of educational needs on global development agendas. The recent incident of Malala Yousafzai, who was attacked by Taliban for speaking about the importance of education for girls, is one that highlights an important issue: Terrorists, Militants and the likes, all flourish on the lack of education and can be uprooted by strengthening our children through education. Why were a group of militants worried by Malala’s speech on education for girls? It was purely because women who are a section of the society who are suppressed and oppressed will be strengthened and will become independent and powerful, which increases threat to such criminals who work merely on the fear factor that they create among the people. In India, though the situation has improved in the past years, there’s still a long way to go. We have made progress in terms of increasing the primary education attendance rate and expanding literacy to approximately three quarters of the population. India’s improved education system is often cited as one of the main contributors to the economic rise of India. Much of the progress, especially in higher education and scientific research, has been credited to various public institutions. As per the Annual Status of Education Report (ASER) 2012, 96.5% of all rural children between the ages of 6-14 were enrolled in school. This is the fourth annual survey to report enrollment above 96%. 83% of all rural 15-16 year olds were enrolled in school. However, going forward, India will need to focus more on quality. As per the latest (2013) report issued by the All India Council of Technical Education (AICTE), there are more than 3524 diploma and post-diploma offering institutions in the country with an annual intake capacity of over 1.2 million. The AICTE also reported 3495 degree-granting engineering colleges in India with an annual student intake capacity of over 1.76 million with actual enrollment crossing 1.2 million. Capacity for Management Education crossed 385000, and post graduate degree slots in Computer Science crossed 100,000. Pharmacy slots reached over 121,000. Total annual intake capacity for technical diplomas and degrees exceeded 3.4 million in 2012. According to the University Grants Commission (UGC) total enrollment in Science, Medicine, Agriculture and Engineering crossed 6.5 million in 2010. Though there is massive improvement in the Education Sector, what needs to be addressed is the fact that two third of the population still lacks education. Poverty is the primary cause for lack of education. The results of lack of education are multiple. I have stated a few important ones that came to my mind. Quality and access to education is the major concern in rural schools as there are fewer committed teachers, lack of proper text books and learning material in the schools. Majority of people living in villages have understood the importance of education and know that it is the only way to get rid of poverty. But due to lack of money they are unable to send their children to private schools and hence depend upon government schools for education. In some of the government schools there is only one teacher for the entire school and if they don’t show up at work, then it is a holiday. If the quality along with number of teachers and, that too committed teachers can be improved in these schools, then aspiring rural children and India can fulfill their dreams of doing something great. Talking of quality education, here is something I read in a recent report, Lack of quality education hindering India’s growth on LiveMint. Come June every year, and Infosys Technologies, India’s second-biggest software services exporter, turns trainer for the nearly 30,000 students it recruits from top engineering colleges every year. Its training campus in Mysore, a two-hour drive from its sprawling headquarters in Bangalore, can house about 15,000 people. New recruits spend up to six months honing their skills as Infosys attempts to fill the gaps left by inadequate college education. The Government had been doing quite a bit for improving the education system of the country drastically, through all possible means. I vouch for it, because I am from the industry and have been working closely with education institutions and governmental bodies. Free education till 14 years of age is also an initiative which has helped increase the enrollments in rural India. Free Books, Bags, Uniforms and meals are provided to attract and encourage people to send their wards to school regularly. There are training sessions organised for government employees through partnerships with private players. Enough funds are sanctioned to the states for improvement in quality education. The only question that remains is, are these funds utilized appropriately? If not, why? Can we as an individual do something for the upliftment of the uneducated lot? If a 16-year old can fight for this basic fundamental right in a country known for its suppression of women, why can’t we in a liberal India? Each One Teach One is one such great initiative. It is a development organization established in 1983 and aims at creating opportunities for the underprivileged children in rural and urban India. Every drop counts and hence every small step by each one of us can result in a better tomorrow for the individual, for the country and for the world. Do your bit in counselling people, directing them to the right places, helping them get their deserved rights. India’s improved education system is often cited as one of the main contributors to the economic rise of India. Much progress has been made in this sector, yet two thirds of our population is deprived of this fundamental human right. Malala teaches us a lot of things and most of it is noble in its own way. She indeed is an inspiration to many. Just this morning over breakfast we were watching CNN Exclusive interview of this lil hero and I must say she’s got the right attitude and the wisdom required. I just wish she happens to be a game changer for the situation of her country. Thank you! I must say ir was just a few hours on the net that I spent to collate this information, but would be glad if it helps change the education system for the betterment of the lot. If a 16 year old girl can voice her opinions without the fear of fundamentalists, the we citizens of Free India have a long way to go to eradicate illiteracy. nice post Rekha. I too have touched on this topic. Yes Kalpana ji! This little girl has shown the world that fighting for a cause fearlessly is what can scare away the sinners. We as a country must fight the corruption at various levels that is one major reason for the lack of quality in education and the low reach of resources allotted for the purpose. She indeed is a great inspiration to one and all. Ignorance is one of the major problems India faces. This can be removed by education. The vested interests (people in positions of power: politicians, businessmen, etc.) want ignorant people to remain ignorant so that they can continue to exploit such people. I agree that the statistics w.r.t. education have improved in India. But, sadly, only the statistics have improved. The quality of education is pretty pathetic. I say this as an employer. People may be qualified, but that does not mean that they are educated. The authorities ensure that people pass examinations just so that the statistics look good. Private medical and engineering colleges are run like shady businesses, not like educational institutions, the focus being only on topline and bottomline. I agree eith you completely regarding the quality of education. That’s exactly why I mentioned about the Infosys training. The government is only bothered about increasing the enrollments and passing percentage. They do not bother about trained faculty and necessary infrastructure. The amounts alotted can do so much, but the outcome is only may be one tenth or even much lesser. Corruption at all levels is a major concern. There are Engineering colleges running with a few chairs underneath a Peepal tree in the rural India, when these same institutions have been sanctioned enough funds for a building and infrastructure. Where have all the funds vanished? Till we get rid of corruption, we as a society will not be able to make much of a progress. Wow, that was quite a well researched topic and your passion for the Right to Education clearly shows up in this post. An extremely commendable effort for Blog Action Day. Having spent almost all of my work life in this sector, RTE does matter a lot to me. Every year crores and crores are sanctioned in the name of education and not even one tenth of it utilized for the cause. If this simple initiative can help do its bit, I’ll be blessed. I am afraid to say but we should stop commercialization of education . Very true. Commercialisation if education and corruption at all ends is what is hurting our educational system. Malala is indeed an inspiration to many. I am glad to have ur perspective as a professional working in the field of education on the above points such as quality of education, resources, child labor, female foeticide and dowry. I feel we need to bridge the gap between urban and rural India but also, the lack of quality teachers. 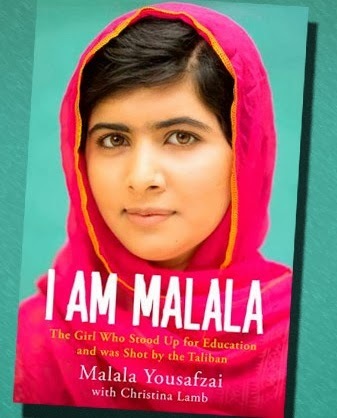 Malala is such an inspiration to us all. It’s amazing how simple the message really is, education for women is the easiest way to a better society. Great job on a comprehensive post. Thorough article, Rekha. This year they implemented RTE in my kids’ school, and I hope that it reaches all schools and all students. Very well written article, Rekha. You are absolutely right, the attack on Malala is the perfect indicator of the fear in the hearts of those terrorists – the fear that once women are educated and made aware of their rights, they will cease to be slaves to men. Malala is the ideal inspiration for young girls everywhere, it is she who should be on magazine covers, not the same old movie stars. Very well researched article Rekha. Education is certainly one of the foremost concerns of any developing country. I believe as compared to other countries, India is topmost in producing intellectuals and bright individuals. We only require more stringent education system and extra aid for lower strata communities. Our education system is crumbling. Even if we are enrolling more and more children, most of the schools do not meet even the bare minimum standards. The condition of teachers is more deplorable. I am scared to think where we will be in the next 20 years. Malala is indeed a great inspiration. The question is how many girls can stand up and speak the truth!! The quality of Education is deteriorating and no one is worried. Govt. is striving to bring new schemes but these are not allowed to bring fruitful results by the people who are working at the level of implementation. Why the increase in Juvenile Delinquency?